Logic gates! The building blocks of computing as we know it. What if we ditch the electrons? 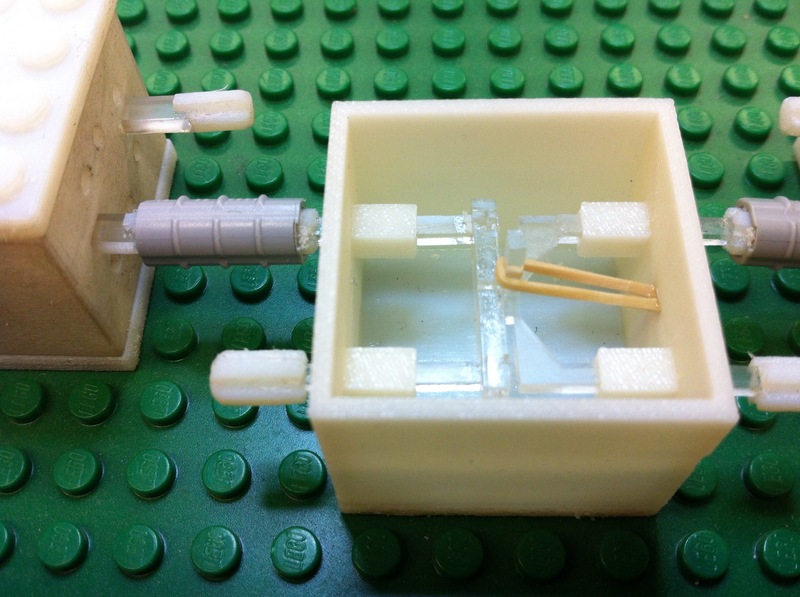 Keshav Saharia’s Lego Logic Push-pull, needs a spring return. Randomwraith’s Lego Logic Push-pull with internal rotating elements, reversible. Mechalogic’s Logic Elements Push-pull, AND & NOT reversible, OR needs a spring return. Xiaoji Chen’s Linkage Computer Rotating logic, reversible, some mechanical issues with parallelogram weakness. Spillerrec’s Lego Logic Gates Push-pull, very compact, needs a spring return. He identifies the problem with needing springs, but doesn’t have a fix. Mentions how AND/OR gates can be reversed to become OR/AND gates. Zeroumus’s AND Gate Push-pull, needs a spring return. KNEX XOR Gate Push-pull, needs a spring return. Carolin Liebl and Lisa Hopf’s NAND Gate Push-pull, reversible, complex. There are many more ideas out there, even water pipe logic, and of course the early mechanical computers Digi-Comp I and Digi-Comp II. Easily chain-able, and simple enough to implement a score of them. This disqualifies most of the designs I found, particularly the ‘no springs’ requirement. Success! Meets all the requirements, and only needs three parts. Now, can an OR gate be designed with the same success? Most OR gates look like this; the output (on the left of this picture) has a flat plate, and either input will push the flat forward. Unfortunately the design needs that elastic band to return the output to zero. Success! Oddly enough, an OR gate is just an AND gate connected up backwards. Even the linkage lengths are the same! Best of all, the OR gate is reversible like the AND gate – no springs and no force required. All the simulations are viewable here.